Free Interactive Notebook Pages for World and US History! Have you thought about using interactive notebooks in your classroom but aren't sure about how to create or implement them? 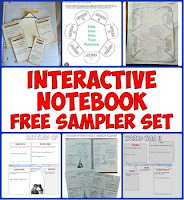 Well, check out this free set of interactive notebook pages for download here! 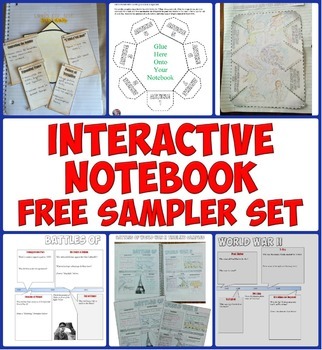 These interactive notebook pages are an awesome way to help students organize their thinking, work independently, and demonstrate creative understanding for a wide-range of historical topics! Each page includes a set of student instructions at the top and then they cut, fold, and write on the page or their notebook. The best part is that students have to think about their own responses because they are not simply copying notes onto an elaborate paper. Each page requires critical thinking and understanding of the topic covered. If you like these free pages, there are lots more for both US and World History available here! New Students of History Complete Curricula by Subscription! After teaching both World and US History for 12 years, I realized I had developed more than enough engaging resources for every day of the school year. I then worked for months to organize them into a Complete Curriculum for both subjects and made both my World and US History curricula available on USB drives on Teachers Pay Teachers to rave reviews. The only downsides to these were 1) there was no way to push out updates of new resources I created, and 2) the upfront cost was prohibitive for many teachers. I've hopefully solved both those issues with my new subscription packages at StudentsofHistory.org! For the past several weeks, I've been setting up the site to include everything for both subjects and also adding Youtube videos and clips, website resources, and more. They're all perfectly organized by unit and then by day with introductions and directions for each unit. Each curriculum includes a ton of Common Core aligned resources, including daily Warm Ups, interactive digital Google Drive Notebooks, traditional and engaging Interactive Notebook pages, amazing lessons in 3D, sets of fantastic, moving Magic Portraits, and so much more! Plus, I'll be adding new resources all the time and subscribers will get immediate access to them all! For a more thorough overview, click here for US History Curriculum subscription and here for the World History Curriculum subscription. PLUS I also set up interactive forums on the site to discuss the resources, share ideas, ask questions, and get to know your fellow history teachers! I'm determined to make this the best online resource for secondary history teachers anywhere! Please take a look and let me know if you have any questions!